My grandmother was 20 in 1950 when she moved from Mexico to El Centro with her mother and siblings. She worked for a family as a housekeeper and as a clerk in their market. 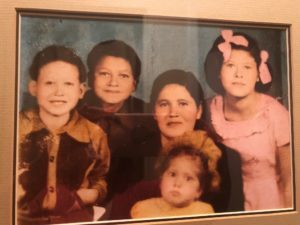 The family treated her kindly and addressed her as Mary to make her sound more “American.” At 88, she still goes by Mary, though her real name is Marie Amparo. She met her future husband, my grandfather, Jose Rodolfo Angel, while waiting in line to obtain her green card. He, too, was undocumented and had been deported to Mexico several times as he searched for employment. After years of navigating the complex immigration system, they became citizens, married and raised four children. They ultimately settled in Sacramento, were active labor union members, devoted Catholics, good neighbors, and enthusiastic volunteers, helping to feed the hungry in their community. They credited the Kennedy family for showing them how to be model citizens. They never took their earned right to vote for granted. Their desire for more led them to leave their homeland for their beacon for hope and opportunity: California. Their story is hauntingly familiar to what happened at our border not long ago. I was chilled when mothers and children separated at the border and am fatigued by our broken immigration system. The explosive outcry of disapproval from so many over the family separation policy, and the widespread moral debate that ensued made this moment a little less dark. The fact is people are finally paying attention, stepping up to speak, to act, and to care. But is that enough in the long term? Marches and demonstrations of leadership do matter, but so does voting. Voting is our pathway to fundamentally change immigration policies and so much more. One of the truest tests of how outraged we are by the inhumane treatment of our fellow man will be who turns out to vote this November. If we as a collective people who care don’t respect our earned right to vote, as my grandparents did, and show up at the ballot box, what will have been the point of our outrage? What will have improved? The next two months are critical. It is up to us to decide who we want to determine the laws of our land and who gets a seat and a voice at the governing table. However, the responsibility is not only on voters. We need something, and someone, of quality to vote for. Candidates need to explain their vision for what a better reality might look like. We need a vision for what a reformed immigration system looks like. Gavin Newsom, the front-runner for governor, has justly focused on improving such policies and supporting protections for undocumented people, as have many congressional candidates working to flip the House to Democratic control. The debate here can help move the needle nationally where neither party is offering a clear plan or vision right now or at least not particularly well. Travel bans and border walls are reckless, so how can a system help create an environment that fosters hope and compassion, not hate, anger and fear? What will California’s leaders do to protect and defend the immigrants who support our economy and improve our communities? So, I ask those currently running for office based on an anti-Trump platform alone to please do better. What do you think needs to happen to fix our immigration mess? Tell us and show us. Justin Knighten is a communications strategist and is vice president of a Sacramento-based public affairs firm. [email protected] He wrote this commentary for CALmatters.